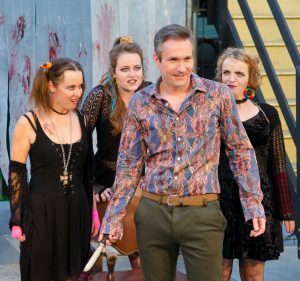 The bloody and ruthless MACBETH is the final main stage show to open at the Cardiff Open Air Theatre Festival, from now until 29 July 2017. Treachery! Murder! Black Magic! When the prophecy of three witches proclaim that Macbeth is destined to become King, he and Lady Macbeth tear away the mask of respectability stopping at nothing in their savage and bloody pursuit of power and success. Cardiff’s annual open air theatre festival has already played host to Spamalot to rave reviews, a Comedy Gala night staged in aid of Amnesty UK, the heart warming and funny Vicar Of Dibley and Hello Cabaret which featured a cast of bright and brilliant young Cardiff stars. Not only has the festival been the biggest challenge Everyman Theatre has taken on to date, their fabulous Youth Theatre will present “Twelfth Night” on Sunday 23 July. Promising young actors from this group have gone on to illustrious stage schools across the U.K. and begun promising careers. And finishing the astonishing line up in time for the school holidays, children’s show Disney’s Aladdin Jr will round off the entertainment twice daily (excluding Mon 24 July) from Saturday 22 July until the festival’s close on 29 July.